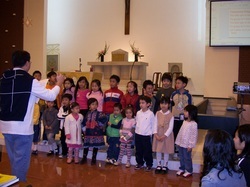 During the school year, St. Ignatius Sunday School meets every Sunday (except every 5th Sunday) at 9:30 am. We warmly invite all children to join us for Sunday School. We would love to see our youth congregation grow. Our teachers are excited and anxious to share the Good News of Jesus Christ with our children. The purpose of this website is to keep everyone informed of Sunday School plans and happenings. If there are any questions, thoughts or concerns about Sunday School, please contact us at any time. You can leave a message with the Chapel Office or by email. I am looking forward to another great year. Don't forget Sunday School Registration is still going on. Please download the enrollment form, complete and return to the chapel office. Starting December 5th, 2010 our Confirmation Class / Youth Group will be in Faber Room. Are you interested in being a Sunday School teacher or substitute? If so please download the Teacher/Substitute Teacher Form and return to the chapel office and we will be in touch with you.